The Raymond F. Kravis Center for the Performing Arts presents the City Theatre & Orlando Repertory Theatre’s Production of the musical The Brand New Kid June 19th – 22nd. Based on a children’s book by Katie Couric, and adapted for stage by Michael Friedman and Melanie Marnich, this family friendly kids’ musical is about being different, and overcoming teasing through the power of acceptance and friendship. The story revolves around Lazlo S. Gasky, who has just moved to the United States to start his first day of second grade. Gasky doesn’t look or speak quite like the other kids, and no one is sure what to make of him. In fact, they respond to his arrival at Brookhaven School by taunting and teasing . But when popular Ellie McSnelly decides to take a chance on him, all the kids learn that our differences are what make us great. 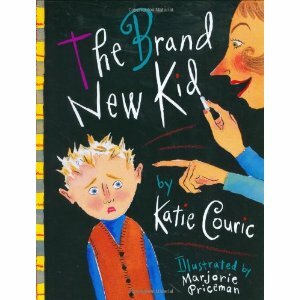 “As loving and wonderful as they are,” Katie Couric says,“children can sometimes be cruel. Kindness can be taught, and perhaps we can all do a better job helping our children learn about tolerance and inclusion.” This idea is central to The Brand New Kid and extends to include children who are misunderstood and feeling left out for any number of reasons. A great way to teach children about tolerance and kindness to others, The Brand New Kid speaks to the continuing issues of bullying in schools that concern all of us. The Brand New Kid will be appearing in the Marshall E. Rinker, Sr. Playhouse of the Kravis Center for the Performing Arts June 19th – 22nd. Show times are Tuesday, Wednesday & Friday at 10:30 a.m. & 1 p.m, and Thursday at 10:30 a.m. & 7 p.m. The Kravis Center is located at 701 Okeechobee Blvd. in West Palm Beach, FL. Tickets for this show are $25 with groups of 10 or more $15, and children Under 1 Year $5. You may purchase tickets and/ or obtain other information online at www.kravis.org. or by phone at 561-832-7469 or 800-572-8471.